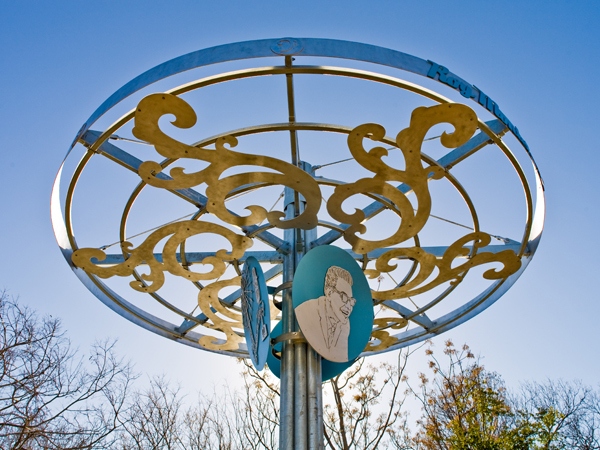 The City of Austin, through the Art in Public Places program, commissioned Austin artist, Connie Arismendi, to create permanent public artworks for three of the five renamed sites along the Trail of Tejano Legends. The sculptures at the Roy Montelongo Scenic Overlook, Nash Hernandez Road, and Perez and Ramos Plaza at the MACC commemorate the significant musical contributions of Austin’s Tejano and Hispanic Communities and enhance people’s understanding and experience of the Trail for residents and visitors of Austin. Working primarily with aqua jet cut aluminum sheet metal, Arismendi’s sculptural works capture the character of each musician and honor their significant cultural contribution. Additionally, to achieve a visual identity for the Trail, the artist integrated a decorative treble clef design and references to a record, CD or spotlight, as recurring motifs, at the individual sites.